A holiday becomes again a holy day when, among other things, we honor the occasion with retellings of particular sacred stories -- stories made sacred by the meaning we give them. What are the stories that consecrate Labor Day? I'm not sure Labor Day has any widely recognized sacred stories, so let me offer a story as a candidate for adopting and making sacred through the widespread retelling of it every Labor Day. 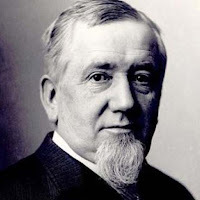 This is the cautionary tale of industrialist George Pullman, born 1831. He founded the Pullman Palace Car Company that manufactured railroad cars, particularly the Pullman sleeping car. In 1880, he bought 4,000 acres 14 miles south of Chicago, and got an architect to design not only his new plant for making railroad cars, but a whole town: houses for 10,000 workers, shopping areas, a church, theatres, parks, a hotel, and a library – all owned by one man. He built and owned the power plant that powered his factory and his town. The town was named after him: “Pullman, Illinois.” Pullman’s workers worked for him, lived in houses owned by him, paid their rent and their utilities to him, and shopped in stores owned by him, strolled in his parks. His aim was to solve the issue of labor unrest and poverty. For years Pullman had been a philanthropic supporter of fine schools – with the aim of providing business with a better quality of laborer. He wanted a happy, loyal workforce, so his town provided for all his workers’ needs. They got a state-of-the art home: indoor plumbing, gas lights, sewers – well above the average dwelling of the time. They got fine country air and beautiful neighborhoods. The mortality statistics, indeed, established that Pullman, Illinois was one of the most healthful places in the world to live. The town created a national sensation. The press praised Pullman’s benevolence and vision. To ensure there would be no unhappiness, Pullman prohibited outside agitators, allowed no saloons, or vice district. The hotel on the edge of town had the town’s only bar, and it was open only to visitors, not the residents. He prohibited independent newspapers, public speeches, town meetings or open discussion. He wanted his workers to have clean homes, so his inspectors regularly entered homes to inspect for cleanliness and could terminate leases on ten days notice. Private charitable organizations were prohibited. He built only one church building in his town: the Greenstone Church. Pullman’s plan was that all religious denominations would band together and share the one building. But the various denominations would not unite, and no single denomination could afford the rent, so the church stood empty for the town’s first seven years until Pullman finally slashed the rent by two-thirds, and Presbyterians rented it. Then in 1893 the stock market crashed. The railroad "bubble" (overbuilding railroads, and relying on shaky financing to do it) burst. The "Panic of 1893" was, at the time, the worst economic depression the United States had ever experienced. 150 railroads closed. There was massive unemployment. Pullman cut his workers' wages by 25 percent or more. He did not, however, reduce the rents he charged his workers for living in Pullman, Illinois. This is part 2 of 4 of "Going Into Labor"
Next: Part 3: "The Origin of Labor Day"
The urge to create an ideal community sprung from his Liberal Religion too I suspect. How Do You Want to Grow?